A fabulous, well loved family home in Crackington Haven sleeping 7, only 350 yards from the beach. With unrivalled panoramic views from the house to the sea and surrounding cliffs. There is a magical well kept garden to explore with stream and woods and a large patio for entertaining overlooking the sea. With the sound of the stream and ocean to wake up to, Dingle Dell is a very special place that you will want to return to time and time again. Hello, I run a holiday company called Cornish Seaview Cottages which advertises cottages in Cornwall. We now have a few more properties in France and our Cornish properties are also growing in number. As a small friendly company we have many loyal customers who enjoy staying in our properties and return year after year. We now look forward to welcoming you. One family bathroom upstairs with separate toilet and a shower room downstairs Plus an outside shower within the garage after a day at the beach. For storage of surfboards or bikes and equipment etc. The kitchen is well equipped with dishwasher, microwave, washing machine and a tumble dryer for guests use. There is an area of seating in the kitchen for meals. A large fridge freezer is provided and extra freezer space in the garage. Sky+ in main living room, NowTV in small sitting room. Tennis courts nearby for guests use free of charge. Outside: Outside there is a large terrace overlooking the sea – perfect for entertaining and a barbeque is provided for your use. Undoubtedly one of the best features of the property is the magical garden – a very special place with secret areas to explore. The attractive sunken dell provides a shady retreat and a pretty stream runs through the bottom of the garden. This in turn leads onto woods and further walks are possible from the property along the coast and inland. With stunning views and a feeling of space and tranquility you won’t want to venture far away. There is also a tennis court in front of the property overlooking the sea, which is included in the tariff. There are a lot of lovely dog walks in the area which include coastal walks. However, the beach is closed to dogs between Easter Sunday and the 30th September. Cleaning / Towels / Linen / Maid service: All bed linen in included with beds made up for your arrival- towels can be hired. Other: The owners have provided Sky+ something to keep the whole family happy. There is also WiFi available along with a DVD and CD player. The front room was cosy and warm with a wonderful fireplace so to sit around. We had a marvellous stay and have got some fantastic memories from our stay . We have been holidaying in Crackington since 1950. 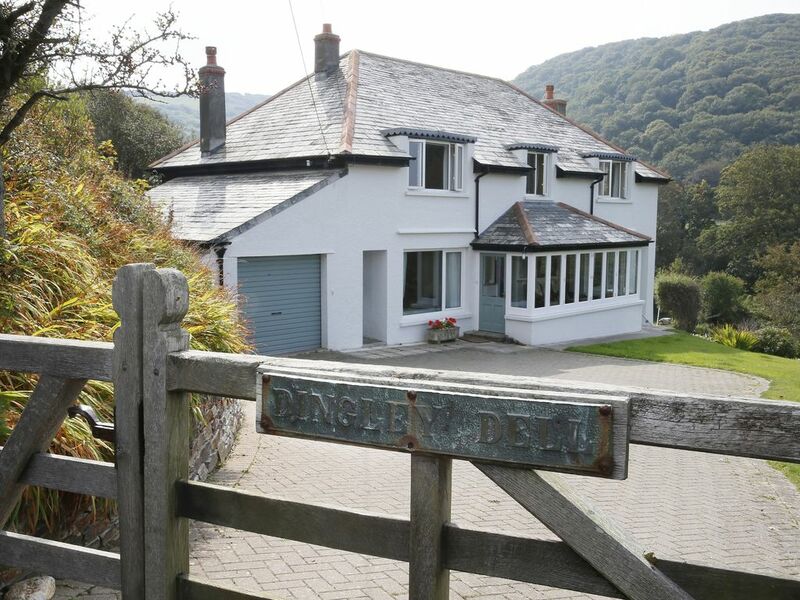 Dingley Dell was the first thing we saw looking out of the Windows towards the sea, and became the dream house of us all. The house is stunning with wonderful views, beautiful period furnishings and features. Our fears about the possibility of an old and cold environment were quickly allayed by the effectiveness of the storage heaters throughout the house and the inglenook gas fire in the lounge. It rained for five days but we were just happy to stay indoors most of the time and watch the seas pounding Penkenna and the black rocks. We have stayed at Dingley Dell several times when it was let out by the previous owner so we particularly wanted to take this opportunity to return. Unlike many holiday properties that we have stayed in, it is a comfortable, well cared for family home and we liked the various improvements that the present owners have made. All our needs were provided for and the grand children (aged between 2 and 7) loved playing in the spacious and well kept gardens. We appreciated being able to use the courts belonging to the tennis club and loved watching the sunsets from the lounge window. The weather was perfect enabling us to spend time on the beach and do our favourite coastal walks (without having to pay out on parking fees!). We certainly hope to return in future years and wouldn't have any hesitation recommending Dingle Dell to others. Thank you for spending the time to write a review. We are so pleased your family enjoyed your stay and the house, weather, tennis and walks met all your expectations! We look forward to welcoming you again next year. You know you go on holiday and they say 'with sea views' and you have to be Quasimodo to bend to see a wave. This property has the 'seaview'. Don't read this... go and see for yourselves. Then enjoy the comfort of the house, or walk down to beach and enjoy not only beach but the great walks up either side of the beach. Or pop into pub or kill yourself in cream with the scones at the cafe. The house/cottage is very comfortable, spacious and a wonderful place to stay. The best part?… The chair that overlooks the seaview in front of the lounge window. I would recommend this cottage to you whole heartily, but you’d book it and then I won’t be able to go again next year! Ohhhh… don’t’ try the 1,000 piece jigsaw… really, take a relaxing book instead! We agree - the views are fabulous! Next time you visit try the easier jigsaws - there's plenty of choice! So pleased you had a great time. Absolutely stunning setting - with views second to none. Great family house which was spotlessly clean and very well equipped. Plenty of rooms to spread out which was ideal for our family group. Will definitely return. Thank you for spending the time to write a review. We are so pleased your family enjoyed your stay and look forward to welcoming you again. Enjoyed returning to Dingley Dell after break of about 15 yrs. Always loved this house, the views are amazing and the garden a total delight. The improvements are just that, the house has so much character and now it is even more comfortable. Still a bit of a problem with the beds in the back bedroom squeaking. It's a really short walk to beach, pub, cafes and coastal path. Lots of exciting places to visit in the area. Didn't wast to leave, looking forward to returning. We are so pleased that you enjoyed your stay in Dingley Dell and found the house to be as welcoming as ever after a 15 yr break! Now that you have discovered us again we very much look forward to your next visit. It is the perfect walking area with the coastal path running close to the property. 350 yards to Crackington Haven Beach. A fabulous cove with rock pools and plenty for building castles when the tide is out. It is a good surfing spot when the conditions are right. Crackington Haven is located in an Area of Outstanding Natural Beauty. It was once a small harbour importing coal and limestone and it has managed to escape any development and is now a small unspoiled, secret, cove. When the conditions are right it is a great surfing spot and there is a lifeguard during the summer holiday weeks. In the spring the cliffs are covered in heather and it is a wonderful place to see the wild flowers and hear the birdsong. The gently sloping beach is perfect for exploring or for relaxing and although pebbly when the tide is in there is plenty of sand for building castles when the tide is out. Crackington really is a special place perfect for a family holiday away from the crowds. For convenience there is a cafe in the village across the road from the beach serving lovely local produce and homemade goodies. The family pub, The Coombe Barton Inn, serves food and there is a local shop within walking distance of the property for beach items. Take a wooded valley walk inland from the car park and enjoy the breathtaking scenery and wildlife. Take a walk North to Pencarrow Point and climb up to Cornwall’s highest cliff at 735 feet. Discover the inspiring parish of St Gennys: churches, ancient farms, historical sites & buildings and tales of shipwrecks. Observe the famous zig-zag folds and faults in rock formations formed millennia ago, from black shale, sandstone and quartz veins. As the tide goes out see what you can find while rock pooling. Booking Notes: 25% deposit required to secure the booking. Balance due 8 weeks before the holiday. Changeover Day: Friday to Friday. 3pm arrival - 10am departure. Notes on prices: Short breaks are available out of peak weeks - minimum rental price £350, weekends will be more.